Zak was born in Butte, Montana, to a hardrock miner and his wife in 1944. He was nine months old when the family moved to Livingston, where his father began working for the railroad. Zak’s parents, Hank and Amanda, were both craftsmen. His mother still enjoys her artistry today. Overcoming the poor education he received in Livingston and despite being dyslexic and barely able to read, Zak entered Montana State University, Bozeman in 1962. He speaks fondly of mentor Robert DeWeese “who taught me to really draw,” and Frances Senska, who introduced him to The Art of Ceramics. After a stint at the San Francisco Art Institute, developing his drawing even further under the eye of Alvin Light and at the same time working more in ceramics with Manuel Neri. Zakovi returned to MSU in 1966 to finish a BSA. He then began graduate work in Humanities. An extension program took him to Arizona State University to study at Paolo Soleri’s Cosanti Foundation. He stayed in that state at the University of Arizona as a teaching assistant and completed his MFA in 1969, returning to Montana in 1970. This latter diverse and inspiring education, combined with his own determination, intelligence, talent, and experience, enabled Zak to become the craftsman and disciplinarian he is today. Zak has also become a Master Builder and On Site Inspector of major construction projects in 5 states. This discipline is evident in the rich textural imagery of his flat work, the result of Zak’s unique usage of mixed media, including conte, acrylics, ink and his own invention of material on which to draw and paint. Leather began as a media exploration for Zakovi. “Another material to manipulate and learn to use sculpturally,” he explains. It was during graduate school in 1969 in Tucson that Zak became so successful with his leather bags for men and women that they were featured in Gentleman’s Quarterly and Vogue magazines that year. His vests, bags and other leather accessories were sold in boutiques throughout the United States, including Hawaii. A photo file of his leather work was requested and is included in the Museum of Contemporary Crafts in Washington, D.C, which led to inclusion of Zakovi’s work in LEATHER, a book published in Holland, featuring 1960’s international leather craftsmen. After graduate school, Zak spent a year in Tucson, then the call of the north beckoned him back to Montana to begin a family. Leather work gave way to construction. Zakovi began as a union laborer, then carpenter, moving up to foreman, then superintendent until he began his own construction company. In time he took the next step, becoming a construction manager and project manager. He designed and hand-built fine homes and commercial buildings in Montana from 1972-1983. The business evolved to a high craft and Art form through Design. Zak’s woodshop grew out of the need for doors, windows, cabinets, and furnishings in the homes he designed and hand built at the time. The woodshop also produced bid and commission work for architects, other contractors, universities, and corporate properties. An injury ended this endeavor and led to a career in construction/project management. As a construction manager, project manager and owner’s representative, Zakovi has worked on numerous major projects from $2 to 20 million, consulting with owners, architects and contractors to coordinate the project scheduling, cost and quality control, hiring personnel, subcontractors and purchasing materials. The end result is a job done for the price agreed, to the quality level described, and on time. Working as a liaison between the tradesmen, the owner, professional team and inspectors – Zak has learned the industry well. In a Civil Engineer’s capacity I was hired to inspect and coordinate compliance with the construction documents for a Federal Fish Technology laboratory and Visitors Center, here in Bozeman Mt. Zak has created many sculptures in wood, ceramics, bronze, steel, mache’, leather and more recently, in stone. It begins with a stone hunt. When Zakovi lived in the Southwest his preference was to go on expeditions within the Apache Nation searching out stone in its natural setting. In Montana he finds stone in his special places, as well as in quarries. But the criteria are the same—finding stones that “I’ve got to have ”. Then it is a matter of following the Yeses. COPD - 2016 Chronic Obstructive Pulmonary Disorder. So no more stone dust or wood dust allowed in my life … the end of 2 decades of sculpting and a decade of wood work! Establishing a studio is an evolved process, requiring setting up a business – books, licenses, office etc.. Then developing a community image, advertising, endless promotional materials and of course a building well equipped with equipment. STONES BY ZAK ~ was my Oracle Arizona studio. I built it from scratch out in the Chaparral dessert, bring electric lines and a road in ½ mile then building studio and cabin. The studio was mostly an out door facility with a tool room. I produced a twelve stone exhibition over a 3 year period along with a few commissions. It ended suddenly when my lover stole the property from me. PLUM STREET STUDIOS INC. is my current studio in Bozeman Mt. In 1998 I converted my Wood Shop / rental property in to “ a studio to die for “ I am the proud owner of a 3000 sq. foot studio complete with Sculpture Garden and it is equipped to the nines. I also have leased a stone yard with a warehouse on it a mile away to store stone, equipment and build larger projects – Stone Architectural features. My investment in property, tools and equipment is in the ½ million range. I am set up to produce work from table size sculpture to 50 ton monumental work- including staircases, water features, walls, dividers … on and on. 2008: Installed “Windjammer III” in the Art on Main Street annual exhibition. 2008: Installed “The Dolmen” at the Bozeman’s Gallatin Valley Mall outdoor art exhibition. 2007 : Received the commission to build a sculptural stone arch for the Great Falls Public Library. A 14 ton free standing archway with running water. 2007: Installed and sold “Mills Memorial” in Bozeman City Cemetery. 2007: Commissioned for a stone property marker “Trio” at the Cikan’s residence. City of Redding Ca. new Sculpture Garden. 2006: One man sculpture exhibition in the RJS building commons area at Big Sky Town Center. 2006: Two outdoor installations of stone and steel sculptures at the Big Sky Town Center development. The Menhir installed in the Main St. round’ a-bout’, sale pending. 2005: Commissioned to design and build a stone staircase including stone sculptural pillars, for a residence at the Yellow Stone Club. A 25 ton stone sculpture. 2005: Installed and sold ”X ~ Pillar” to Insty Print of Bozeman. 2004: Commissioned to design and over see construction of a water feature and powder room in a residence at Yellow Stone Club. 2004: Representation by RED RAVEN GALLERY Big Sky Montana. 2003: One-man painting and sculpture exhibition at the Main Stope Gallery, 45 W Park Street, Butte, Montana. 2001-02: Two installations – “Dolmen” a stone, timber and concrete sculpture at the Bozeman Deaconess Hospital – and “T-2” a stone and steel Stella at Bozeman’s 777 building. 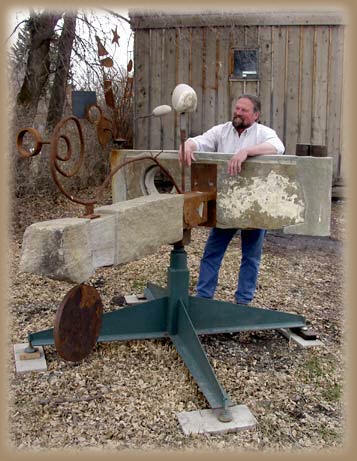 2000-2002: Developed a sculpture garden and painting gallery at Zakovi’s Plum Street Studio, 417 Plum, Bozeman, Montana. Ten stone and steel sculptures, many paintings and drawings available. 1998: ZAC-LAND, a current flatwork exhibition consisting of eleven pieces of mixed media painting spanning a decade of work. September 1 – October 15, 1998, Emerson Cultural Center, Bozeman, Montana. 1994 – 1995: One-man sculpture exhibition featuring twelve stone-steel-bronze pieces weighing from 150 to 2400 pounds. This show took over a year to produce at a cost of $36,000. New Doors on Art, Tucson, Arizona. 1989 – 1990: Major one-man showing of paintings and sculpture including thirty pieces of current flatwork and fifteen pieces of sculpture. The show proved to be a success both by sales and by the region’s favorable response. Museum of the Rockies, Bozeman, Montana. 1986 – 1987: One-man show, Bob and Gennie DeWeese Home Gallery, Bozeman, Montana. 1986 – 1987: Group show, Beall Park Art Center, Bozeman, Montana. Group show opening the DeWeese Gallery, Bozeman High School, Bozeman, Montana. 1985 – 1986: Applied for and received and anonymous private grant to resume work as a full-time painter and sculptor for twelve months. (Extended period to twenty months with personal savings.) Bozeman, Montana. 1985: One-man show in hometown of Livingston, Montana of personal importance since it marked a return to the fine arts after sixteen years in the creative, yet functionally-oriented building industry. Danforth Gallery, Livingston, Montana. 1984: Commission to create mixed media wall plaque, Medical Arts Complex, Bozeman, Montana. 1980: Commission for exterior sculpture completed in 1981, Western Bank, Bozeman, Montana. Zak has self-published 12 Books / Booklets / Essays they can be found on this website under the B & E key. · Donated 2 stone sculptures to Bozeman High School and 1 to the Emmerson Cultural Center – 2015 -16.